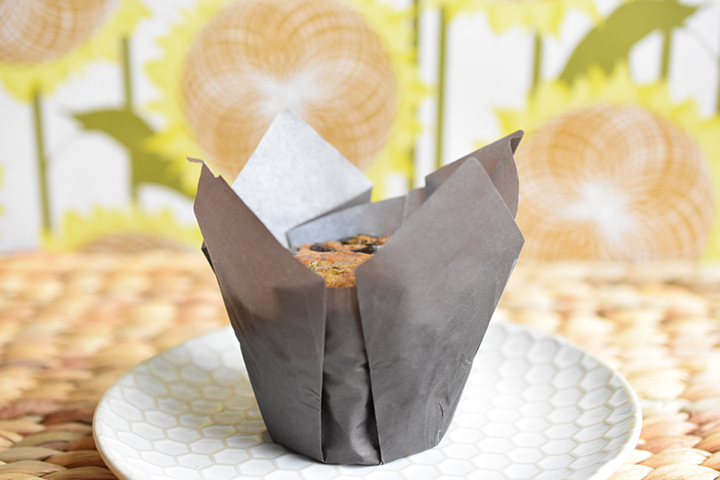 Rise ‘n shine – we just baked you our ZBF Morning Muffins! 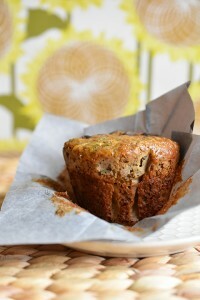 If you haven’t already figured it out, Z stands for zucchini, B is for banana, and F is the secret ingredient…Flaxseed! These muffins have a bunch of veggies, a half a cup ground flaxseed, and no added fats (i.e. butter or oil), which combine to make these muffins a great way to start the morning. We purchase coarse ground flaxseed from our local grocery store. However, if you can’t find pre-ground flaxseed, you can pulse whole flaxseed in your food processor for a few seconds. Just make sure when measuring your flaxseed for this recipe to measure it after it has been ground. 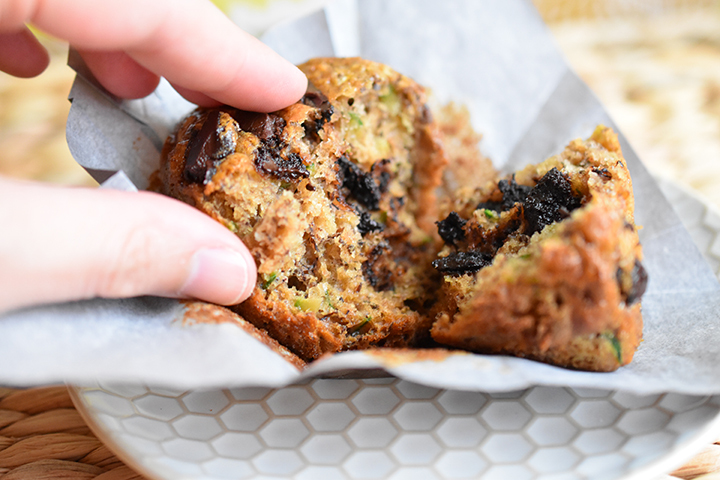 If you already haven’t noticed, if there is a way to add veggies to baked goods, you can count on us… for example, see our Carrot & Zucchini Vanilla Cake, Spiced Pecan Sweet Potato Cupcakes, THE Zucchini Bread, Buttermilk Carrot Cake, or our Pumpkin Pecan Fudge. 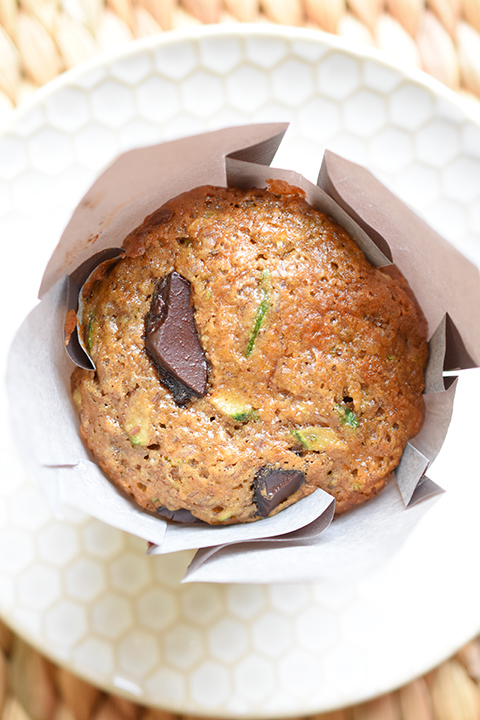 We decided to take these muffins up a notch by adding chopped dark chocolate chunks. 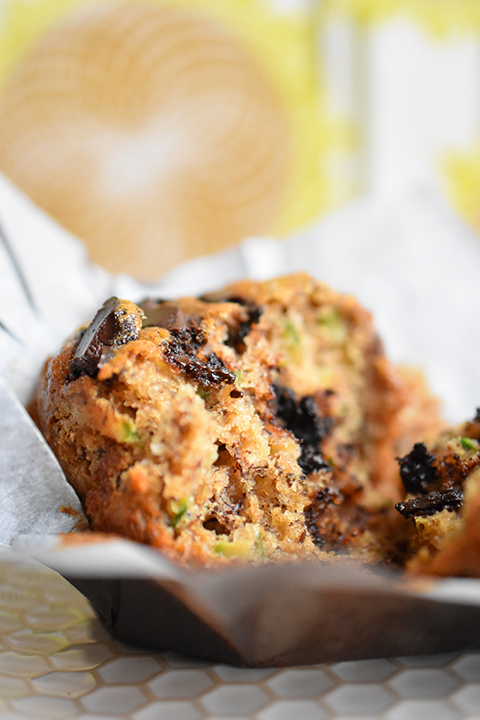 However, if chocolate isn’t your thing for breakfast, these muffins are great without it, or you can add raisins instead. Yum! 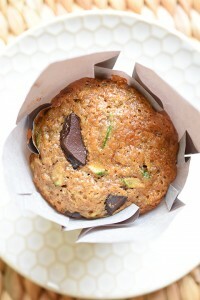 Zucchini, banana, and flaxseed muffins with dark chocolate chunks. Preheat oven to 350 °F and line your muffin tray, or lightly coat 12 standard muffin cups with cooking spray. In a large bowl, whisk together flour, flaxseed, brown sugar, baking soda, baking powder, salt, cinnamon, nutmeg, and clove. Set aside. In a small bowl, mash banana and whisk in milk, egg, and vanilla. Add the chocolate chunks into the flour mixture and stir until combined. Add the banana milk mixture and zucchini to the flour mixture and stir to combine. Be careful not to over mix. Divide batter among muffin cups. Bake until a tooth pick inserted in center comes out clean, 20 to 25 minutes. Let muffins cool completely in pan on a wire rack, about 30 minutes. There is a difference in size between a standard muffin tin and a cupcake tin. If using a cupcake tin, fill 18 cups approximately ¾ of the way full and bake 18-20 min.